(Kongsberg, 8 November 2018) Today, Telenor Group launched the very first 5G pilot in Scandinavia. The pilot will serve as a testbed for the superfast fifth generation mobile network in Norway. The pilot was launched during the technology and innovation conference Kongsberg Summit and is a milestone in Norwegian telecommunications history. "We have been preparing for 5G for a long time and it's great to finally be able to share the technology with families and businesses in the technology-city of Kongsberg. We are looking forward to testing the technology and learning as much as possible together with our new pilot customers," says Sigve Brekke, President & CEO of Telenor Group. The development of mobile networks is faster than ever, with new generations launching roughly every decade since the introduction of analogue NMT (1G) in 1981. In 2012, Telenor launched 4G followed by 4G+, and according to Speedtest from Ookla, Telenor now has the fastest mobile network in the world. Today, Telenor is kicking off its test of 5G in Kongsberg. "5G is more than a new generation of mobile network - it unleashes a vast potential within data and telecom services and will improve most services and solutions across industries. With today's launch of the very first 5G pilot in Scandinavia here in Kongsberg we have a flexible toolkit in place, which will help accelerate digitalisation, both in Norway and other markets in which Telenor operates," says Brekke. Telenor's pilot project offers select residents of Kongsberg the chance to test 5G technology until summer 2019. Initially, five families will test broadband and TV services delivered via 5G in their homes. Subsequently, the pilot will be expanded to include more test users. Several Norwegian businesses are also involved, including Coop, The Norwegian Air Ambulance Foundation and Applied Autonomy. "We are starting in Kongsberg and will expand to offer more pilot locations in 2019, while gradually preparing for the commercial roll out of 5G in 2020," says Bjørn Ivar Moen, acting CEO of Telenor Norway. Compared to 4G, 5G is a far more advanced and innovative technology with even more capacity, higher speeds and faster response time. 5G will provide Norwegians with access to features and services that have not been seen before. The new mobile technology will enable fibre optic communication speeds in your handset. "5G technology could fundamentally impact several critical societal functions, such as traffic management, health services, and important communications services like emergency communication networks," says Moen. The 5G network will consist of several network slices, which are fundamentally several different logical networks on the same physical infrastructure. These networks can be adapted to serve different needs and use cases in a completely new way, and function as if they are independent networks despite belonging to the same physical 5G network. As a result, we can expect higher speeds, minimal latency and a more reliable network. "The 5G network is extremely fast, stable and secure, and will dramatically improve services critical to our society. The new network will be a driver of digital transformation and we are looking forward to continuing on that journey," says Moen. 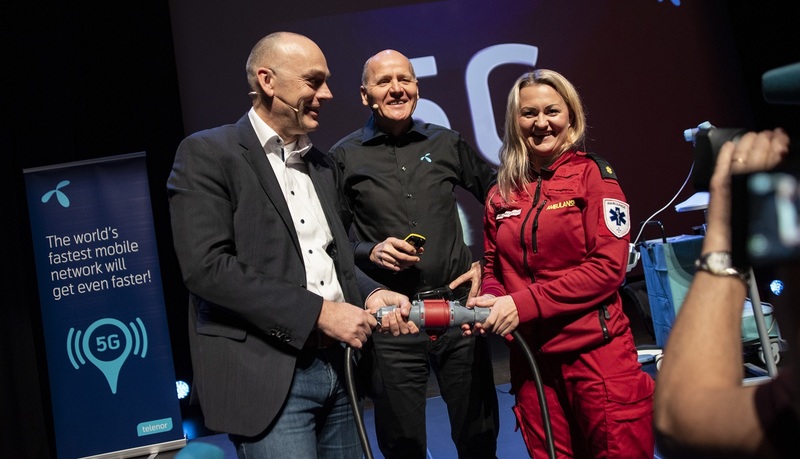 Download high res image of the moment Telenor's 5G pilot was switched on here (from left; Bjørn Ivar Moen, acting CEO of Telenor Norway, Sigve Brekke, President & CEO of Telenor Group, and paramedic Anne Elisabeth Hengna. Zero-G: The first mobile service in Norway was given the not-so-catchy name "Public Land Mobile Service" (OLT or Offentlig Landmobil Tjeneste in Norwegian), but following its launch in 1966, it quickly became known as 'the Donald Duck phone' due to the distortion of voices using it. 1G: 1981 saw the launch of the NMT network, and the mobile phone suddenly began to appeal to high flying stock brokers and other people who wanted to make calls from their cabin, in the car or at the airport. 2G: The first text message was sent on 3 December 1992 and said: 'Merry Christmas'. 1993 saw the launch of the worldwide GSM system in Norway and the country stepped into the digital era. 3G: Nowadays, people consider the few occasions when experience 3G as a form of punishment, but when it was launched in 2004 the technology was revolutionary and the speed left users flabbergasted. The best-selling mobile of the year was the Nokia 2600, of which 150 million handsets were sold globally. 4G: Fourth generation mobile services provide customers with a bit of elbowroom. The focus is firmly on high capacity services such as mobile broadband, MMS, video calling and mobile TV with HD quality. 5G: On 8 November 2018, Telenor switched on its 5G network in Kongsberg, thus launching the first 5G pilot in Scandinavia with real customers. With potential download speeds of 1-10 Gbps, this network is way faster than 4G. However, the most important distinction is in how different user groups can obtain their public services via network solutions that use one and the same physical network. Examples of use cases include self-driving buses, eHealth and manufacturing.